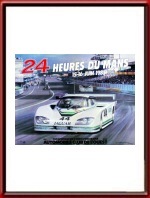 Vintage Original 1985 24 Hours of Le Mans Poster. June 15 & 16, 1985. The 1985 Le Mans poster is part of the "The star car used for sponsorship" era in Le Mans posters which lasted from 1981 to 1997. 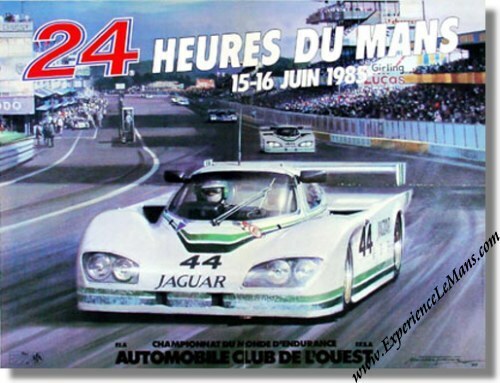 Jaguar "bought" the 1985 poster to celebrate its return to the Le mans 24 Hours race after an absence of 28 years and hired renowned British motorsports artist Michael Turner for the artwork. Michael has chosen the entry to the Dunlop curve as his focal point. The race was won by Klaus Ludwig / Paolo Barilla / John Winter in their # 7 Porsche 936B (S/N 117) with a total of 374 laps to their name. For the full results of this race, please see 24 Heures du Mans results 1985.